Cherry trees provide a delicious harvest and beautiful blossoms. They can thrive in Hawaii, but different varieties require different care and temperatures. For example, black cherry trees should be planted above 2,000 feet, while dwarf cherry trees need full sun and lower elevations. Decide what type of variety you want to have depending on your region, if you want it for fruit or for aesthetic appeal. When growing cherry trees in Hawaii, keep in mind some key tips such as preparing the soil correctly and pruning regularly to keep the tree at maximum fruit production. Check with your local nursery to see what cherry tree variety will grow best in your area. They range from tart to mouth-watering sweet, from dwarf to large. Choose a self-pollinating cherry tree if you only want fruit, as you only need one to have fruit. Otherwise, you'll need to get a couple trees. Make sure the cherry trees are healthy and grafted. Plant cherry trees in Hawaii at the start of the wet rainy winter season for easier establishment. Pick a planting site that has well-drained soil in full sunshine. Prepare the planting site before you purchase the cherry tree so the roots aren't dry too long. Dig a hole twice as deep as the root ball. Sprinkle black cinder on the bottom of the hole for better drainage, if necessary. Mix in organic compost into the backfill soil. Plant the cherry tree so the crown is even with the soil level. Water thoroughly so the soil can settle in the roots and prevent air bubbles from gathering. Add more soil on top if needed to even it around the base. For multiple plantings, make sure to space them about 20 to 30 feet apart (for standard size). For dwarf cherry trees, space 8 to 12 feet apart. Create a support system for the young cherry trees. Pound the three stakes into the ground about one foot deep, in a triangle shape around the base of the tree. Use three pieces of rope that are sized about twice the distance from the trunk to the wooden stakes. Pull each rope piece through a one-foot long piece of the bicycle tube. Firmly secure the ropes around the cherry tree's trunk. Remove these after the first year or two; once the tree is strong. 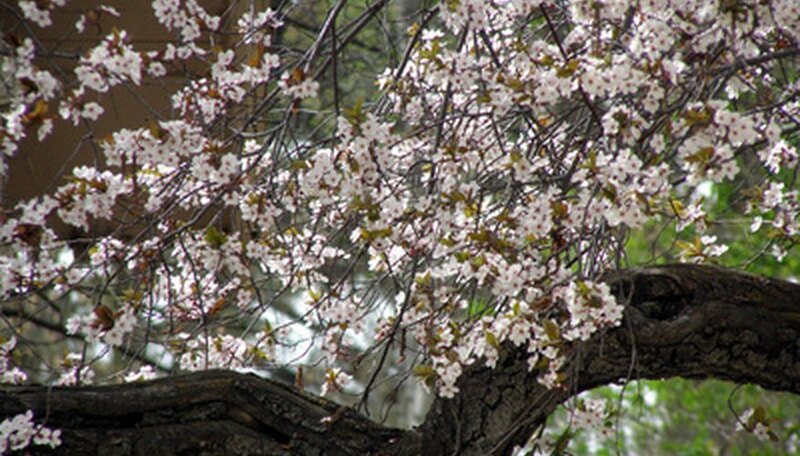 Fertilize cherry trees in early spring with a balanced fertilizer. Apply composted manure each late winter. This encourages more growth and larger harvests of cherries. The amount applied depends on your variety, but most only require light layers. Prune when young, if possible. Cut back any dead, diseased or broken branches at any time during the year. In late summer after fruiting is when the majority of the pruning should occur. Cut back any crossing branches, extremely crowded areas, and weaker shoots or smaller branches. Remove weeds under the canopy around the base regularly. Harvest the cherries ever year. During the third growing season is when the cherry tree should start producing.